Author’s note: What I'm describing in the article best applies to those for whom spinal flexion is not contraindicated. It is recommended that those with osteoporosis avoid spinal flexion. Talk to your doctor or physical therapist if you have any questions. Recently, I’ve noticed a theme in yoga classes. People are being told that they shouldn’t round their spines because it’s bad for their backs and will reinforce poor posture. While it’s true that you don’t want to live in a permanent hunch at your desk, this is an oversimplification, and completely eliminating flexion can lead to its own set of problems. In fact, building strength in flexion can actually be beneficial and can even help improve posture and decrease pain. This idea becomes especially important in yoga, because so many of the poses—such as revolved extended side angle pose, revolved triangle pose, and half lord of the fishes pose—involve extending and rotating at the thoracolumbar (TL) junction (the point where the rib cage ends and the low back begins). When done often enough, this type of movement can cause spinal instability, especially if coupled with weakness in the spinal flexors. Additionally, only practicing asanas in neutral and extension can create postural issues. While posture doesn’t always correlate with pain, it’s not uncommon that if you’re stuck in one posture, when you need to do something that requires a different posture, you may experience muscle spasms or pain. This can happen because your body doesn’t have the strength to control a posture that you don't often use. You may have noticed that a lot of people who practice yoga have a distinct posture. They’ve lost their thoracic curve, and they stand with a rib flare and an anterior (forward) pelvic tilt. Typically with this type of posture, the spinal extensors are overworking and hypertonic, while the spinal flexors are underutilized and weak. When we have this particular muscular imbalance, we tend to experience muscle spasms at the TL junction, as well as neck and low back pain, because these areas of the body are being compressed. That compression manifests as hyperextension at the TL junction or low back, which is further exacerbated in extension poses, such as cobra, upward facing dog, and wheel. I want to be clear that spinal flexion is more than collapsing into a slumped position and allowing gravity to have its way with you. To do it well, you actually have to work for it and recruit muscles that you won’t ever use if you’re in neutral or extension all the time. The below video is an example of moving with active spinal flexion. When you move in active spinal flexion, you engage your anterior core muscles, such as the psoas, iliacus, obliques, and rectus abdominis. 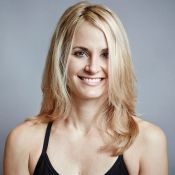 This helps counteract the overuse of your spinal extensors—including the erector spinae and quadratus lumborum—which tend to get overused both in yoga class and in daily life. An example of this is tadasana (mountain pose). Traditionally, tadasana has been documented to show that you should stick out your chest, which has been misinterpreted as a good thing to do in your daily life standing posture. However, neutral alignment—and in turn, ease of movement—actually requires that we retain our thoracic curve in order to avoid compression at the TL junction. The same thing happens in regular life, when people think that sitting up straight at their desk requires lifting the chest, causing the same overuse of the spinal extensors and corresponding pain. As a result, you may find that by strengthening your spinal flexors, you’re able to hold your head, ribs, and pelvis in a more neutral place, thus decreasing compression and pain in the neck and mid and lower back. It’s also worth noting that your ability to control movement is as important as the directions in which you move. Now let’s return to the idea of thoracic flexion. 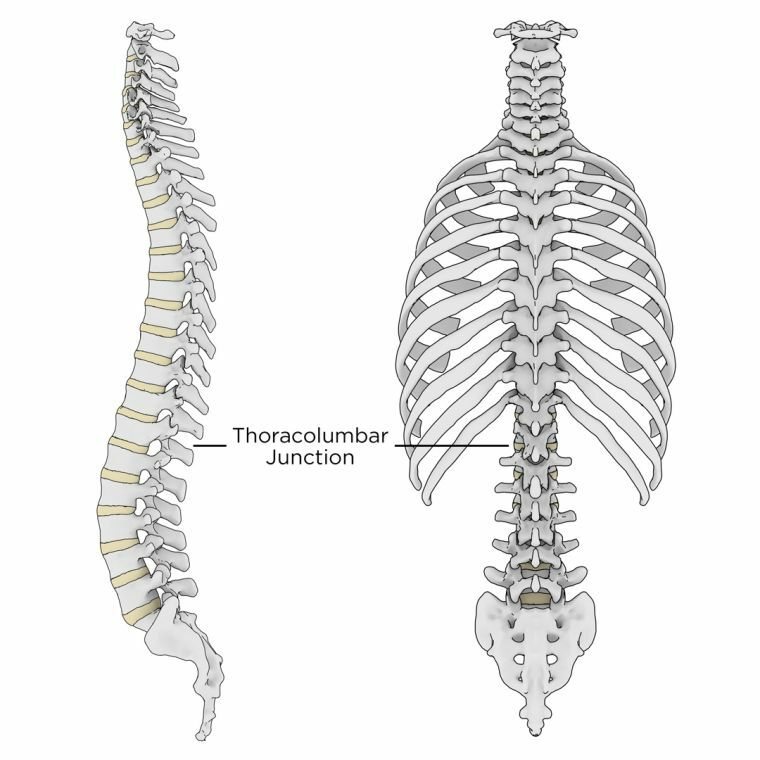 Because many people who do yoga never load their spines against gravity in thoracic flexion without also rounding their low back and tucking their tail under, they are unable to flex their thoracic spine without also flexing their lumbar spine. This becomes especially apparent in a traditional sit-up. When they go to lift their head and chest, they automatically round in their lower back. This isn’t bad. However, if you have the strength to flex your thoracic spine against gravity while being able to maintain lumbopelvic stability, then this skill can translate into the activities of your daily life. For example, when you’re sitting slumped in your chair and you try to correct it by lifting your chest, then you’re still compressing your spine at the TL junction and reinforcing a position that correlates with pain. However, if you practice the exercise I show in the video below, you will be able to maintain a neutral pelvis while strengthening your upper abdominals, which is needed to counteract the gripping in the mid back that results from rib flaring. As a result, you may find that you experience less pain or discomfort during basic daily tasks like sitting at your desk or driving. The exercise described in the video above also requires neck flexion against gravity. Because many of us have a forward-head posture, if you practice it without supporting your head in your hands, you can also improve neck stability by strengthening your deep neck flexors—which will help hold your head on your spine as you move through daily life. While yoga poses are extremely beneficial, they’re also highly specialized. Because of this, we want to be mindful that we don’t neglect any movements that are missing from our traditional asana practice, such as active spinal flexion against gravity. The human body has an average of 307 joints and, thanks to those joints, countless movement options. Ultimately, you want to explore all of the options so that they’ll be available for you to use both in and out of the yoga studio. 1. Letafatkar, A., Nazarzadeh, M., Hadadnezhad, M., & Farivar, N. (2017). The efficacy of a HUBER exercise system mediated sensorimotor training protocol on proprioceptive system, lumbar movement control and quality of life in patients with chronic non-specific low back pain. Journal of Back and Musculoskeletal Rehabilitation, 30(4), 767-778. 2. Kong, Y., Jang, G., & Park, S. (2015). The effects of prone bridge exercise on the Oswestry disability index and proprioception of patients with chronic low back pain. Journal of Physical Therapy Science, 27(9), 2749-2752.